Greetings from The 88 Project! We are bringing you news, analysis, and actions regarding human rights and civil society in Vietnam during the week of February 5-11. On February 6, environmental activists Hoang Duc Binh and Nguyen Nam Phong were sentenced to 14 and 2 years in prison; three days later, six Hoa Hao Buddhists were sentenced to various prison terms for “disturbing public order.” International groups and governments have condemned both cases as repression of freedom of speech and freedom of religion. Blogger Mother Mushroom is suffering from health ailments in prison; she is only one year into her ten-year sentence. There is one piece of good news amidst the intensity of events this week, however: Can Thi Theu was released from prison on February 10. In the news and analysis section, read about environmental issues in Vietnam. You can also watch several videos this week: an interview with a Hoa Hao Buddhist former political prisoner, an interview from Hoang Duc Binh himself, the story of Can Thi Theu, and our short documentary on the repression of dissent in Vietnam. Please take action for Hoang Duc Binh, who faces one of the longest current prison sentences for a known political prisoner in Vietnam. On February 6, Hoang Duc Binh and Nguyen Nam Phong were sentenced to 14 and 2 years in prison, respectively, in a court in Nghe An province. The environmental activists were involved in Formosa protests. Binh, vice president of the independent Viet Labour Movement and a well-known blogger who covered news on the environmental disaster, was sentenced for “resisting persons in the performance of their official duties” under Article 330 and “abusing democratic freedoms to infringe upon the interests of the State” under Article 331 of the new 2015 Criminal Code. He was particularly targeted for livestreaming a march against Taiwanese company Formosa, whose pollution caused a massive environmental disaster that began in April 2016. Binh received one of the harshest prison terms for a known prisoner at this time. At trial, he affirmed that he made comments about police brutality during the livestream, but he also maintained that this was not a criminal act because it was the truth. Watch an interview (in Vietnamese, with English subtitles) with Hoang Duc Binh, where he explains in his own words why he was inspired to begin his activism. Phong was tried for “resisting persons in the performance of their official duties” under Article 330. He was the driver for Catholic priest Nguyen Dinh Thuc from the Song Ngoc parish and Hoang Duc Binh when Binh was arrested on May 15, 2017. Binh was escorting priest Nguyen Dinh Thuc from the Song Ngoc parish in Dien Chau district to Vinh city. The police stopped their car in Dien Chau district’s center and violently removed Binh from the car. When the police ordered the driver, Phong, to open the car to let them take Binh out, Phong refused. Six Hoa Hao Buddhists: Bui Van Trung, Bui Van Tham, Nguyen Hoang Nam, and Le Thi Hong Hanh (left to right, above), and Le Thi Hen and Bui Thi Bich Tuyen (Bui Van Trung’s wife and daughter whose movement has been restricted within their locality even though they were not in detention) were tried on February 9 in An Giang province. Bui Van Tham was charged under Article 257 (“resisting persons in the performance of their official duties”) and Article 245 (“causing public disorder”), while the other five were charged under Article 245 of the 1999 Criminal Code. Trung and Tham were sentenced to six years in prison; Nam was sentenced to four; Hanh and Tuyen were sentenced to three; and Hen was given a two-year suspended sentence. According to the indictment by the People’s Procuracy of An Phu district on November 30, 2017 (available in Vietnamese here), the defendants “disturbed the public order and impacted the safety and order of the traffic, causing a traffic jam on national route 91C by hindering, obstructing, pushing, and screaming to provoke and denounce transportation police.” According to supporters, this is a case of repression against Hoa Hao Buddhist disciples who came for the commemoration of the death of Bui Van Trung’s mother at Ut Trung sangha. Human Rights Watch called on the Vietnamese government to halt the trial and take time to evaluate whether this was a case of persecution and discrimination based on religious belief. “The government should stop harassing and arresting those who belong to unsanctioned religious groups and leave people to practice their faith as they see fit,” said Brad Adams, Asia Director, in the appeal. Several Hoa Hao Buddhists are currently in prison in Vietnam, including female land rights activist Tran Thi Thuy. The EU’s External Action division also denounced the sentences, calling on Vietnam to release those jailed for their beliefs and peaceful practices and to uphold international human rights obligations to protect freedom of religion. For more background on the harassment of members of the Hoa Hao Buddhist sect, you can view this video (in Vietnamese, with English subtitles), which highlights the struggle of Hoa Hao Buddhist and former political prisoner Mai Thi Dung, who endured horrible treatment in prison. The video is from Luong Tam TV, an independent news station, which Le Thu Ha, co-defendant along with human rights lawyer Nguyen Van Dai, helped to run. Imprisoned blogger Nguyen Ngoc Nhu Quynh’s (Mother Mushroom) mother, Nguyen Thi Tuyet Lan, visited her in prison briefly on February 5 and reported that Quynh is still in poor health, with curled up fingers and toes and having suffered from an allergic reaction to medication. The prison has denied Quynh medication from her mother. Quynh is serving a 10-year sentence for blogging about social and environmental issues, including the 2016 Formosa spill. Her appeal of her sentence was denied in November 2017. A piece of positive news, at last. 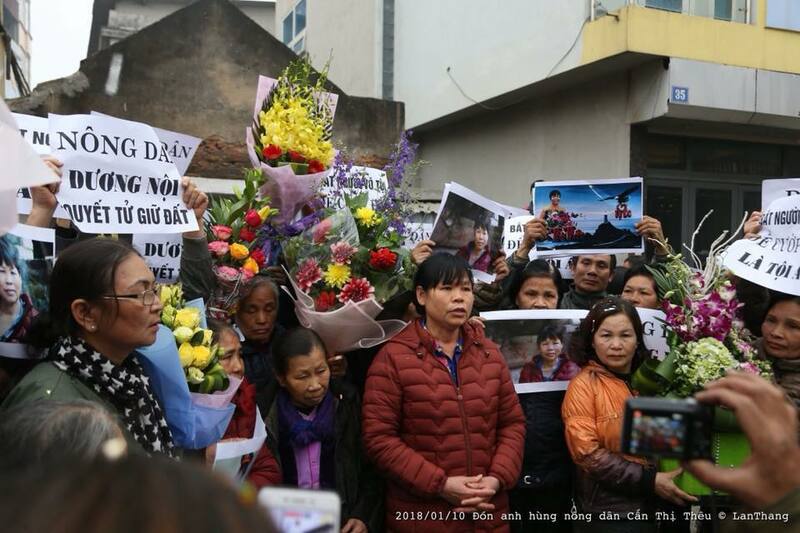 Can Thi Theu was released from prison on February 10, 2018, and returned to her home in Duong Noi, Ha Dong, Ha Noi, where she was warmly welcomed by family, friends, and fellow villagers. Her welcoming home quickly became a demonstration of the determination of the villagers to keep their land from being seized by the government, as Can Thi Theu condemned the illegal forced eviction and vowed to continue her fight, and as her supporters brought flowers and a banner saying “Duong Noi people would die to keep their land” (see picture above). Can Thi Theu’s story and the context of land confiscation in Vietnam are told in this bilingual video produced by artist Kim Chi, Hélèna Lee, and friends. Did you know that The 88 Project has a documentary about political prisoners in Vietnam? Almost five years ago, we released “88: The Repression of Cyber Dissidents” (in English). It features interviews about the escalating crackdown on freedom of expression in Vietnam and the tactics used to harass and imprison activists. Though it was released in February 2013, its themes and concerns are still highly relevant today, as the situation in Vietnam has only worsened in the years since. The documentary is also available with Vietnamese subtitles, here. Send an Urgent Action appeal from Amnesty International Canada on behalf of Hoang Duc Binh and fellow environmental activist, Bach Hong Quyen, who is wanted by authorities.